For too long, dire messages and gloomy assumptions about the fate of the planet have lent an air of hopelessness to one of the biggest challenges facing society. Conservationists feel stymied. Businesspeople feel villainized. We have come to accept the view that preserving the planet and growing the economy are mutually exclusive. But maybe this dichotomous view of human needs and conservation is itself the problem. What if advancing conservation and human development is not an either-or proposition? What if we can do better in both? The World Health Organization, the World Economic Forum and other organizations have pointed to air pollution, climate change and water scarcity as some of the biggest threats to human well-being. 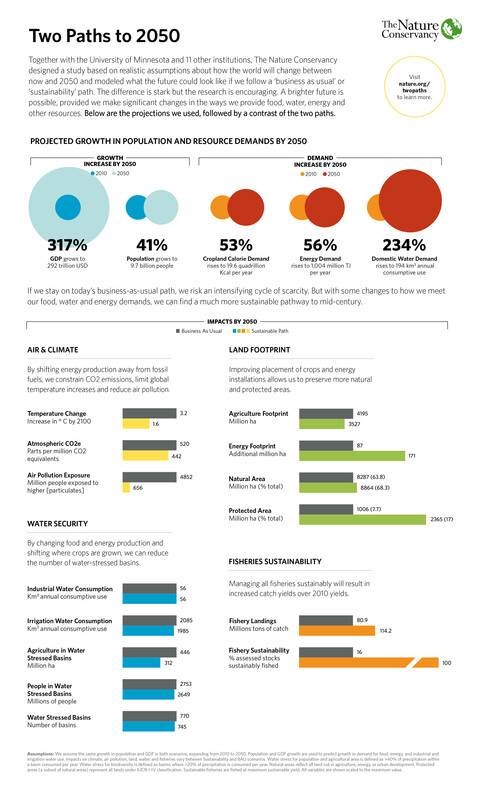 These are environmental challenges that also intersect with threats to biodiversity. By 2050, the world’s population is projected to be 10 billion. We’ll see accelerated impacts on natural resources that intensify this challenge and others, such as the already harsh impacts of climate change on both people and nature. The question of whether we can advance both conservation and human development is the driving force behind a new study by 13 institutions, including The Nature Conservancy and the University of Minnesota. From the outset, we stepped back and reexamined the concept of sustainability from the bottom-line up, so to speak. Taking an in-depth look with global systems models, we compared the status quo, business-as-usual path we are headed down today against a version of sustainability based on realistic and achievable changes in how we use energy, land and water. We discovered something some might find surprising – hope. For our analyses, we incorporated leading projections in population and GDP growth, and associated increases in energy (~50%), food (~50%) and domestic water use (~21%) by 2050. We also looked at how increased production to meet these needs would affect global land and water use, air quality, climate and fisheries. We found that shifting how and where food and energy are produced can help us meet global growth projections while achieving national habitat protection commitments, reducing greenhouse gas emissions in line with the Paris Agreement climate targets, ending overfishing, reducing water stress and dramatically improving air quality. By making changes to our production systems, we can achieve a more sustainable future – a planet that can support the 10 billion people and millions of other life forms that will call Earth home by the middle of this century. One key requirement for achieving the more hopeful scenario is cooperation. Making the necessary changes will require breaking out of our usual lanes of conservation, health, development, economics and all the other sectors where we so often find ourselves confined. Meeting our climate goals, for example, will require an aggressive effort to reduce fossil fuels and the greenhouse gases that follow, from a projected 76% share of total energy in 2050 to 13%. We can do this with a smart combination of solar, wind and nuclear energy. And we can buy ourselves the time needed to make this transition by investing in natural climate solutions – conservation and land management strategies that maximize the carbon storage potential of our landscapes and coasts. We also anticipate an increase in food demand 54% above today’s levels in 2050, but we find that increased demand can be met using less land than we use for agriculture today. Shifting crops within agricultural regions to areas where they grow best can reduce water demands and improve yields, while lowering water stress and pollution, and respecting food sovereignty (a country’s ability to produce food as it does today). In addition, investments in soil health can improve agricultural yields while also sequestering more carbon from the atmosphere and supporting biodiversity. The key, of course, is making those changes soon. If we continue down our business-as-usual path, we’ll see accelerated climate change, loss of habitats and biodiversity, greater water insecurity and dangerous levels of air pollution. It’s a dark prospect for us and for nature. Our analysis is not the first to address these questions, of course. A number of prominent scientists and institutions have put forward thoughtful plans for a sustainable future. But often such plans consider the needs of people and nature in isolation from one another, or are based on the assessment of limited sectors or geographies. What we’ve attempted to do is consider global economic development and conservation needs together, holistically, in order to find a viable, sustainable path forward. The path we show is one of many possibilities. We provide this analysis as a contribution to the shared evidence base needed to engage effectively, collaborate and make informed decisions for the good of people and the planet. We welcome like-minded partners and we invite productive critics to share their perspectives. Most of all, we encourage people from all sectors of society to join the conversation, to fill gaps where they exist and to bring other important considerations to our attention. Conserving nature while providing water, food and energy for a growing human population is possible. It is not an either-or proposition. But our scenario of a more sustainable future does rely on one thing – fast action. Several of the expected changes assume progress will be well underway by the end of the next decade, if not sooner. Success depends on our willingness and ability to address economic growth and the future of the planet in a smart and coordinated manner.